The aluminum and steel industries continuously battle for supremacy in becoming the metal of choice in automotive body construction. 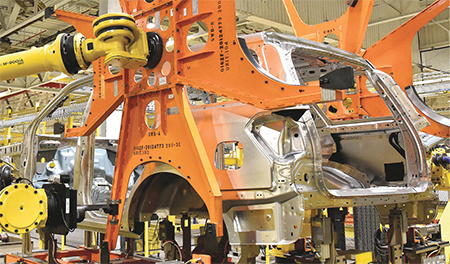 This makes sense—with about 2 tons of sheetmetal purchased for each of the 17-million vehicles sold annually in the United States, there isn’t another industry that offers such high-volume sales opportunities. Each metal grade provides critical characteristics that help optimize the more than 500 stampings found in a typical vehicle. A material’s strength is a function of its chemical composition, its thermo-mechanical processing route (e.g., converting from a thick slab to a thin sheet), and subsequent heattreatments. These variables make it impossible to state that one material always is stronger than another. For example, many aluminum grades are stronger than steel grades, but rarely are they intended for the same application. Furthermore, strength is not the only consideration. Weight, ability to be formed into the desired shape, ability to be joined to the neighboring parts, stiffness and cost represent some of the many other facets to be considered. Stiffness of a component is a function of material type and geometry. On the material side, stiffness depends on a property known as the modulus of elasticity, Young’s modulus. Unlike strength, which can vary from grade to grade (or even coil to coil), Young’s modulus essentially is constant for a given alloy composition, independent of heattreatment, processing or cold work. Young’s modulus for steel is about three times that of aluminum. For a fixed geometry, a part made of sheet steel will be three times as stiff as if the part were made from aluminum. Put another way, an aluminum part under load will deflect three times as much as a similarly loaded steel part. The thickness and shape of a formed part also contributes to its stiffness. Stiffness is proportional to the cube of the thickness. To neutralize the effect of aluminum being one-third the stiffness of steel, an aluminum part must be made 44-percent thicker than a steel part of the same shape. Even this increased thickness offers the potential for weight savings, as aluminum has one-third the density of steel. Automakers also must specify sheetmetal that can be produced to Class A surface standards. Current technology limits this to using sheet steel or aluminum with strength below about 300 Mpa, although grades under development of both materials exceed this amount. Joining does not present a significant hurdle, since several cost-effective techniques exist to mate the outer panel to the inner panel. With a similar upper strength available in either material, and several grades of either material that can be produced sufficiently thin, the one offering the best combination of cost and weight savings will emerge as the strategic choice for hang-on panel applications. Body-structure applications present many challenges. Increased stiffness will typically improve handling and reduce noise, vibration and harshness (NVH). In addition to the inherent stiffness associated with the material and geometry of a part, NVH characteristics can be improved by using lightweight polymer sheets or foams. Crash resistance, on the other hand, is more closely associated with strength. For the same design, steel offers a significant advantage in available choices. Without the constraint of a Class A surface, commercially available steel grades offer tensile strength exceeding 1600 MPa. This isn’t to say that aluminum-intensive body structures are not possible—the market offers many examples. However, they skew toward more expensive vehicles where lightweighting for fuel-economy improvements is not a primary issue and sheetmetal cost becomes a smaller percentage of the transaction price. Improved crash performance comes with higher strength as well as with components having crash-resistant design elements such as closed sections, larger flanges or more shape—all possibly requiring greater formability from higher-strength aluminum grades. Placing more shape into a part also increases stiffness. Consider a piece of paper: It’s pretty flimsy, but place a crease down the center and it becomes more rigid. Additional shapes placed into parts to restrict flexing include darts, beads and ribs. Do you want to learn more about different sheetmetals and formability? Then plan to attend PMA’s Sheetmetal Formability of Steel, Aluminum and Stainless Steels seminar in Cleveland, OH, June 26-27. Visit www.pma.org to register or contact Marianne Sichi at msichi@pma.org for information.